Tube List: 0A2 (1), 5Y3GT (1), 6AL5 (3), 6AQ5 (1), 6BA6 (7), 6BA7 (2), 6CB6 (1), 12AT7 (1), 12AX7 (1). 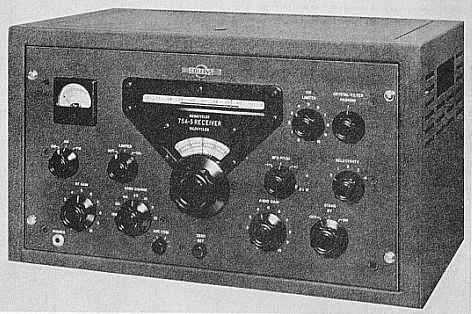 The Collins 75A-3 is a dual conversion receiver covering the 160 thru 10 meter amateur bands. Selectivity choices include four positions for the crystal filter and a switch for mechanical filter selection in the 455 kc IF stage. This is the first amateur band receiver to incorporate a mechanical filter design. There are provisions for 2 plug-in mechanical filters, the 3 kc factory standard and an optional 800 cycle filter for CW. The new mechanical filter offers a rectangular selectivity curve with steep skirts for rejection of adjacent frequency interference. This provides optimum selectivity for single sideband reception. Modes of operation include AM, CW, and SSB. Accurate tuning is accomplished through the use of a slide rule drum dial calibrated in .1 Mc and a vernier dial calibrated in 1 kc increments (2 kc increments on the 10 and 11 meter bands). Separate noise limiters are used for AM and CW operation. An optional 100 kc crystal calibrator (8R-1) is available as a plug-in unit. Other options include a plug-in NBFM adapter (148C-1) and external cabinet mounted speaker (270G-2). Image and IF rejection better than 50 dB. Drift is negligible after warm-up. 2 uv for 6 dB signal-to-noise ratio. 3 kc Mechanical Filter: 3 kc nominal (6.0 dB points); 6.5 kc (60 dB points). 800 cps Optional Mechanical Filter: 800 cps nominal (6.0 dB points); 1.8 kc (60 dB points). Crystal Filter: 40 cycles nominal (6.0 dB points); 4.0 kc (60 dB points). Audio output level is within 6 dB for an RF input change of 5 uv to .5 v.